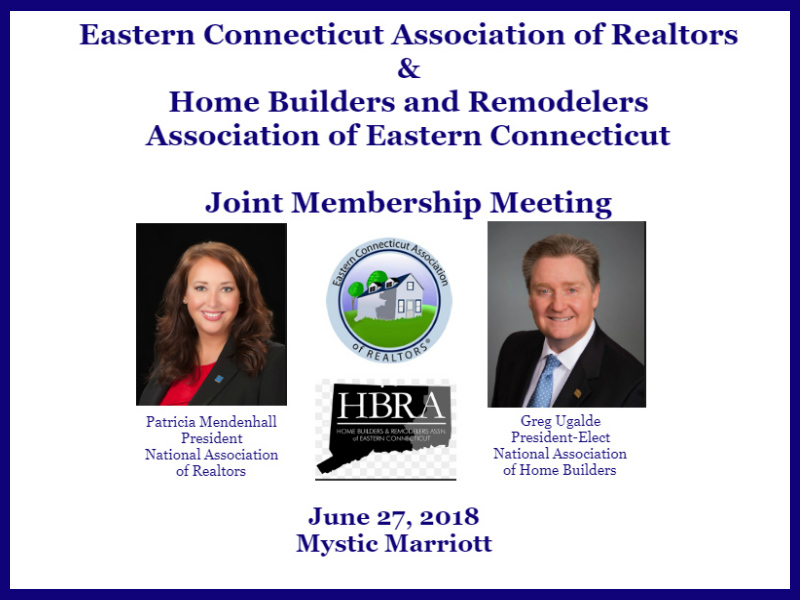 The Home Builders and Remodelers Association of Eastern Connecticut and the Eastern Connecticut Association of Realtors held a joint membership meeting featuring National Association of Home Builders President-elect, Greg Ugalde and National Association of Realtors President Elizabeth Mendenhall. Mr. Ugalde is currently First Vice Chairman of his board but more importantly is President and Chief legal officer of Torrington based T&M Building Co., Inc. and has a birds eye view of the challenges facing the recovery of the housing industry in Connecticut. According to Mr. Ugalde, the three “L”s that affect home building are Lumber, Labor and Land. The cost of lumber is up 60% since the beginning of 2017. That is an increase that took effect before tariffs were mentioned. 30% of the lumber used in construction is Canadian. American lumber has, in part, become so expensive due to EPA regulations on thinning forests. Not only has regulation affected harvesting wood but it has also fed some of the wild fires in the western United States. The NAHB has been able to hold face to face meetings with EPA Secretary Pruitt to express the concerns of the association with great results, but is strongly asking that tariffs on Canadian lumber be rescinded. The second “L” deals with labor. For decades the American Dream was go to college and get a good job. College debt has changed the mindset quite a bit. Eastern Connecticut had been way ahead of the curve with vocational technical schools, such as nearby the nearby facility named for former governor, Ella Grasso. The problem is the current legislature in its efforts to trim budgets has abandoned programs in these already set up facilities in order to save money. The average age of an electrician or plumber in our state is approaching 60 years old. Now more than ever is the time to be trying to attract students into the trades instead of cutting programs. Finally, the third “L” affecting housing is land. The approval process and regulations are 25-30% of the cost of home building. Land use regulations stifle the building process. Blockchain technology is being introduced into the title search process to lessen the amount of time and the costs involved in the process. National Association of Realtors President Elizabeth Mendenhall noted that June has been Home Ownership Month. She also cited statistics saying home prices are rising but existing home sales were down because inventory is so low. Median home prices are higher in the northeast than in the rest of the country. She noted that 5% of the homes sold in Connecticut are new homes compared to 20% in her home state of Missouri. Another disturbing fact is that in the time period between 2011 and 2017 home prices rose 40% in contrast to a 15% rise in income and 20% of the homes sold were senior market related. Young people saddled with student loan debt are taking longer to get into the home buying market. Those people aged 25-34 saw the home ownership rate of 39% in 1996 slip to 35% in 2016. In 2008 the home ownership rate plummeted to 1940’s rates but is steadily coming back. In the 1990’s realtors were essential as they had the Multiple Listing Books. Now a buyer can go on-line to look for a home. That doesn’t mean Realtors will become obsolete. We will get you pre-approved first. There is a huge difference between pre-approval and pre-qualified. Let us make suggestions on who can help you the most. Buyers still need realtors for negotiations, suggesting structural, septic and pest inspectors, suggesting attorneys and setting up showings. Realtors negotiate your home inspection repair requests with the seller’s agent. Repairs can be asked for first or concessions made on the price to remedy any reasonable concerns found by the home inspector. Realtors give advice on what is and is not reasonable. A realtor will monitor your loan commitment and your current credit status. Buying a car or going on vacation via your credit card will change your credit approval rating. Realtors strongly advise you to avoid purchases that will affect your credit score and we keep up to date with what the lender situation is for you. The search process may have changed to digital but the need for a good realtor is still prevalent. The joint meeting of ECAR and HBRAEC goes a long way to bring professionals from both fields together to better serve the home buying public.